I have had an amazing week of 5th December – 8th December to train educators at Tung Wah Group of Hospitals Nursery Schools in Hong Kong. I provided a 4-day Reach & Match training to 40 teachers from 16 nursery schools. The Hong Kong TWGH Nursery schools provide care and education services to children aged 2-6, prepares children to enter primary school. They also provide special training programmes for children with mild disability. Growing up in Hong Kong, it is so special for me to see the children in my hometown benefit from the Reach & Match Inclusive Learning Program. 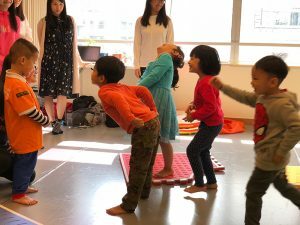 The workshop included research in inclusion, case studies, applications, hands-on demonstration of over 30 exercises and activities, and trial practices with children. It also included brainstorming new classroom ideas with the teachers, and discussion and reflection with teachers about how they will adapt the program to their curriculum in practical ways. We also developed adaptations and modifications with teachers, professionals in order to make sure that all children with different cultural backgrounds and physical needs are happily included in the program. The program educates teachers the true essence of inclusion and improves teachers’ competence in inclusive teaching and provides an open and innovative channel for teachers to create and design an inclusive learning environment. The teachers and therapists were so passionate and engaging in learning the exercises and activities. At the end, we had a great sharing and evaluation session, and I am so confident that these learning kits will be fully utilised by the schools.